To be refinished and re-upholstered. A set of four fine French Art Deco walnut bridge armchairs with bronze sabots by Jules Leleu. 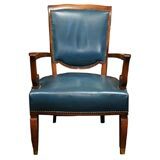 A fine French Art Deco medium size upholstered club armchair by Jules Leleu with sycamore legs. 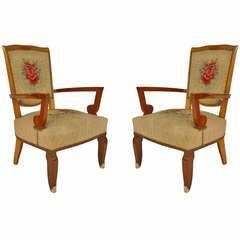 A pair of French Art Deco stained beech bridge armchairs by Jules Leleu. 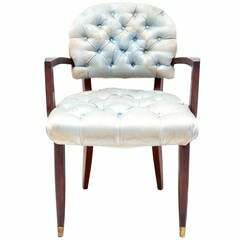 A French Art Deco stained beech bridge/desk armchair by Leleu. 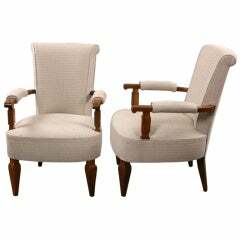 A rare neoclassical pair of Jules Leleu armchairs in French walnut. 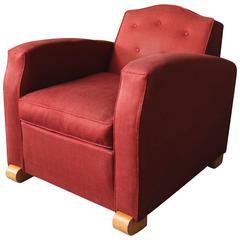 French Art Deco armchair. Architect Jules Leleu Completely restored, surface made by piano lacquers to the high gloss. New upholstery in red leather. Material: Macassar ebony veneer.